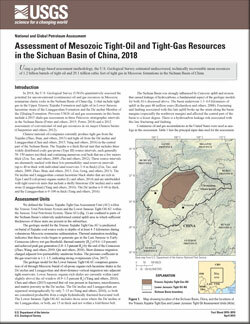 Using a geology-based assessment methodology, the U.S. Geological Survey estimated undiscovered, technically recoverable mean resources of 1.2 billion barrels of tight oil and 29.1 trillion cubic feet of tight gas in Mesozoic formations in the Sichuan Basin of China. Potter, Christopher J.; Schenk, Christopher J.; Mercier, Tracey J.; Tennyson, Marilyn E.; Finn, Thomas M.; Woodall, Cheryl A.; Leathers-Miller, Heidi M.; Marra, Kristen R.; Le, Phuong A.; Drake, Ronald M.; Brownfield, Michael E.; Pitman, Janet K.
Potter, C.J., Schenk, C.J., Mercier, T.J., Tennyson, M.E., Finn, T.M., Woodall, C.A., Leathers-Miller, H.M., Marra, K.R., Le, P.A., Drake, R.M., II, Brownfield, M.E., and Pitman, J.K., 2019, Assessment of Mesozoic tight-oil and tight-gas resources in the Sichuan Basin of China, 2018: U.S. Geological Survey Fact Sheet 2019–3010, 2 p., https://doi.org/10.3133/fs20193010. 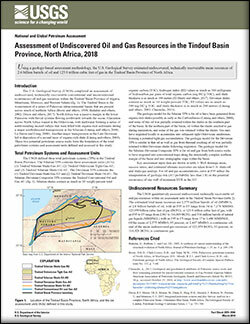 Using a geology-based assessment methodology, the U.S. Geological Survey estimated undiscovered, technically recoverable mean resources of 2.6 billion barrels of oil and 123.9 trillion cubic feet of gas in the Tindouf Basin Province of North Africa. 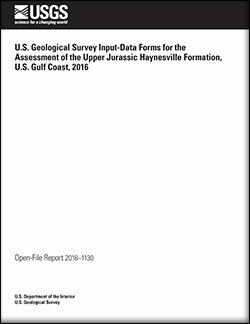 Brownfield, Michael E.; Schenk, Christopher J.; Mercier, Tracey J.; Woodall, Cheryl A.; Le, Phuong A.; Tennyson, Marilyn E.; Finn, Thomas M.; Gaswirth, Stephanie B.; Pitman, Janet K.; Marra, Kristen R.; Leathers-Miller, Heidi M.; Drake, Ronald M.
Brownfield, M.E., Schenk, C.J., Mercier, T.J., Woodall, C.A., Le, P.A., Tennyson, M.E., Finn, T.M., Gaswirth, S.B., Pitman, J.K., Marra, K.R., Leathers-Miller, H.M., and Drake, R.M., II, 2019, Assessment of undiscovered oil and gas resources in the Tindouf Basin Province, North Africa, 2018: U.S. Geological Survey Fact Sheet 2019–3006, 2 p., https://doi.org/10.3133/fs20193006. 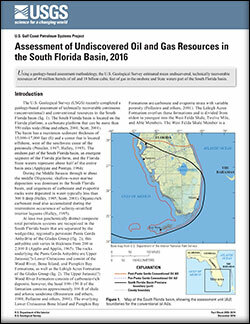 Using a geology-based assessment methodology, the U.S. Geological Survey estimated mean undiscovered, technically recoverable resources of 49 million barrels of oil and 18 billion cubic feet of gas in the onshore and State waters part of the South Florida basin. Roberts-Ashby, Tina L.; Hackley, Paul C.; Lohr, Celeste D.; Schenk, Christopher J.; Mercier, Tracey J.; Whidden, Katherine J.; Le, Phuong A.; Tennyson, Marilyn E.; Gaswirth, Stephanie B.; Woodall, Cheryl A.; Brownfield, Michael E.; Leathers-Miller, Heidi M.; Marra, Kristen R.; Finn, Thomas M.
Roberts-Ashby, T.L., Hackley, P.C., Lohr, C.D., Schenk, C.J., Mercier, T.J., Whidden, K.J., Le, P.A., Tennyson, M.E., Gaswirth, S.B., Woodall, C.A., Brownfield, M.E., Leathers-Miller, H.M., Marra, K.R., and Finn, T.M., 2019, Assessment of undiscovered oil and gas resources in the South Florida basin, 2016: U.S. Geological Survey Fact Sheet 2018–3074, 4 p., https://doi.org/10.3133/fs20183074. 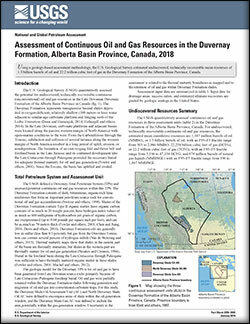 Using a geology-based assessment methodology, the U.S. Geological Survey estimated undiscovered, technically recoverable mean resources of 1.3 billion barrels of oil and 22.2 trillion cubic feet of gas in the Duvernay Formation of the Alberta Basin Province, Canada. 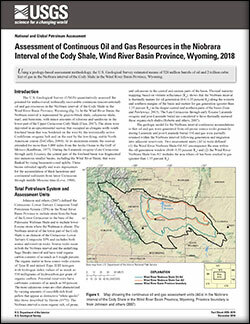 Schenk, Christopher J.; Mercier, Tracey J.; Tennyson, Marilyn E.; Le, Phuong A.; Brownfield, Michael E.; Marra, Kristen R.; Gaswirth, Stephanie B.; Leathers-Miller, Heidi M.; Drake, Ronald M.
Schenk, C.J., Mercier, T.J., Tennyson, M.E., Le, P.A., Brownfield, M.E., Marra, K.R., Gaswirth, S.B., Leathers-Miller, H.M., and Drake, R.M., II, 2019, Assessment of continuous oil and gas resources in the Duvernay Formation, Alberta Basin Province, Canada, 2018: U.S. Geological Survey Fact Sheet 2018–3065, 2 p., https://doi.org/10.3133/fs20183065. 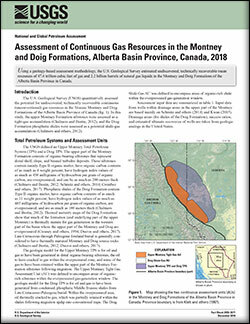 Schenk, Christopher J.; Mercier, Tracey J.; Tennyson, Marilyn E.; Finn, Thomas M.; Woodall, Cheryl A.; Le, Phuong A.; Brownfield, Michael E.; Marra, Kristen R.; Leathers-Miller, Heidi M.
Using a geology-based assessment methodology, the U.S. Geological Survey estimated means of 528 million barrels of oil and 2 trillion cubic feet of gas in the Niobrara interval of the Cody Shale in the Wind River Basin Province, Wyoming. Finn, Thomas M.; Schenk, Christopher J.; Mercier, Tracey J.; Tennyson, Marilyn E.; Le, Phuong A.; Brownfield, Michael E.; Marra, Kristen R.; Leathers-Miller, Heidi M.; Drake, Ronald M.; Woodall, Cheryl A.; Kinney, Scott A.
Finn, T.M., Schenk, C.J., Mercier, T.J., Tennyson, M.E., Le, P.A., Brownfield, M.E., Marra, K.R., Leathers-Miller, H.M., Drake, R.M., II, Woodall, C.A., and Kinney, S.A., 2018, Assessment of continuous oil and gas resources in the Niobrara interval of the Cody Shale, Wind River Basin Province, Wyoming, 2018: U.S. Geological Survey Fact Sheet 2018–3076, 2 p., https://doi.org/10.3133/fs20183076. 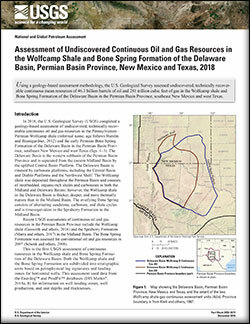 Using a geology-based assessment methodology, the U.S. Geological Survey assessed undiscovered, technically recoverable continuous mean resources of 46.3 billion barrels of oil and 281 trillion cubic feet of gas in the Wolfcamp shale and Bone Spring Formation of the Delaware Basin in the Permian Basin Province, southeast New Mexico and west Texas. Gaswirth, Stephanie B.; French, Katherine L.; Pitman, Janet K.; Marra, Kristen R.; Mercier, Tracey J.; Leathers-Miller, Heidi M.; Schenk, Christopher J.; Tennyson, Marilyn E.; Woodall, Cheryl A.; Brownfield, Michael E.; Finn, Thomas M.; Le, Phuong A.
Gaswirth, S.B., French, K.L., Pitman, J.K., Marra, K.R., Mercier, T.J., Leathers-Miller, H.M., Schenk, C.J., Tennyson, M.E., Woodall, C.A., Brownfield, M.E., Finn, T.M., and Le, P.A., 2018, Assessment of undiscovered continuous oil and gas resources in the Wolfcamp Shale and Bone Spring Formation of the Delaware Basin, Permian Basin Province, New Mexico and Texas, 2018: U.S. Geological Survey Fact Sheet 2018–3073, 4 p., https://doi.org/10.3133/fs20183073. 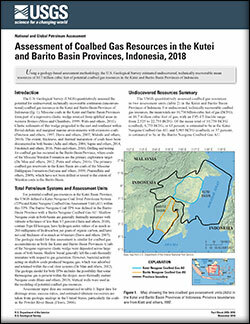 Using a geology-based assessment methodology, the U.S. Geological Survey estimated undiscovered, technically recoverable mean resources of 10.7 trillion cubic feet of potential coalbed gas resources in the Kutei and Barito Basin Provinces of Indonesia. Schenk, Christopher J.; Mercier, Tracey J.; Le, Phuong A.; Tennyson, Marilyn E.; Finn, Thomas M.; Brownfield, Michael E.; Marra, Kristen R.; Gaswirth, Stephanie B.; Leathers-Miller, Heidi M.; Pitman, Janet K.; Drake, Ronald M.
Schenk, C.J., Mercier, T.J., Le, P.A., Tennyson, M.E., Finn, T.M., Brownfield, M.E., Marra, K.R., Gaswirth, S.B., Leathers-Miller, H.M., Pitman, J.K., and Drake, R.M., II, 2018, Assessment of coalbed gas resources in the Kutei and Barito Basin Provinces, Indonesia, 2018: U.S. Geological Survey Fact Sheet 2018–3055, 2 p., https://doi.org/10.3133/fs20183055. Moore, Thomas E.; Gautier, Donald L.; Schenk, Christopher J.
Schenk, C.J., 2018, Geology and assessment of undiscovered oil and gas resources of the Northern West Siberian Mesozoic Composite Total Petroleum System of the West Siberian Basin Province, Russia, 2008, chap. 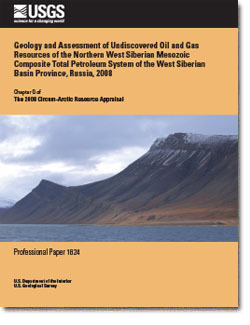 Q of Moore, T.E., and Gautier, D.L., eds., The 2008 Circum-Arctic Resource Appraisal: U.S. Geological Survey Professional Paper 1824, 26 p., https://doi.org/10.3133/pp1824Q. 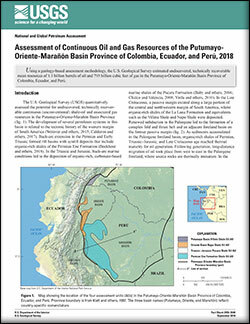 Using a geology-based assessment methodology, the U.S. Geological Survey estimated undiscovered, technically recoverable mean resources of 1.1 billion barrels of oil and 793 billion cubic feet of gas in the Putumayo-Oriente-Marañón Basin Province of Colombia, Ecuador, and Perú. Schenk, Christopher J.; Mercier, Tracey J.; Pitman, Janet K.; Finn, Thomas M.; Le, Phuong A.; Gaswirth, Stephanie B.; Marra, Kristen R.; Leathers-Miller, Heidi M.
Schenk, C.J., Mercier, T.J., Pitman, J.K., Finn, T.M., Le, P.A., Gaswirth, S.B., Marra, K.R., and Leathers-Miller, H.M., 2018, Assessment of continuous oil and gas resources of the Putumayo- Oriente-Marañón Basin Province of Colombia, Ecuador, and Perú, 2018: U.S. Geological Survey Fact Sheet 2018–3048, 4 p., https://doi.org/10.3133/fs20183048. Paxton, Stanley T.; Pitman, Janet K.; Kinney, Scott A.; Gianoutsos, Nicholas J.; Pearson, Ofori N.; Whidden, Katherine J.; Dubiel, Russell F.; Schenk, Christopher J.; Burke, Lauri A.; Klett, Timothy R.; Leathers-Miller, Heidi M.; Mercier, Tracey J.; Haines, Seth S.; Varela, Brian A.; Le, Phuong A.; Finn, Thomas M.; Gaswirth, Stephanie B.; Hawkins, Sarah J.; Marra, Kristen R.; Tennyson, Marilyn E.
Paxton, S.T., Pitman, J.K., Kinney, S.A., Gianoutsos, N.J., Pearson, O.N., Whidden, K.J., Dubiel, R.F., Schenk, C.J., Burke, L.A., Klett, T.R., Leathers-Miller, H.M., Mercier, T.J., Haines, S.S., Varela, B.A., Le, P.A., Finn, T.M., Gaswirth, S.B., Hawkins, S.J., Marra, K.R., and Tennyson, M.E., 2018, U.S. Geological Survey input-data forms for the assessment of the Upper Jurassic Haynesville Formation, U.S. Gulf Coast, 2016: U.S. Geological Survey Open-File Report 2018–1130, 62 p., https://doi.org/10.3133/ofr20181130.